View from Hays Woods looking towards Oakland on the Monongahela River. We often think of going on adventures as traveling to far off places with big mountains and majestic views, but adventures are everywhere as I discovered this past weekend. As a way to motivate myself back to trail running, (I'm more of a watersports person) I recently signed up for a half marathon with a friend I met through our 3ROC Tuesday Night Trail Runs. As part of our training plan, my new trail-running partner and I agreed that we should make our longer weekly runs serve the dual purpose of training and adventuring on trails in places we had never run before. When she brought up the idea of running at Hays Woods, I thought, "Awesome!" Hays Woods had been on my mind to check out ever since I read the article that it had been donated to the City of Pittsburgh and would become the largest city park. I mean, how cool is it that there is 600+ acres of wooded land just on the edge of our city. I was eager to go exploring. Type II Fun...Misadventure or Adventure? At first I was excited when my new trail running partner Sarah texted to meet up at Hays Woods, then -- knowing that I had a commitment later in the morning -- I nearly backed out for a more familiar route. I thought for a moment, we might get lost or have some difficulty finding our way. Sometimes you should listen to your instincts. But if you don't, there might be a good story to tell. I reconsidered and said the heck with it, how hard can it be? There are marked trails on Google Maps and the MTB Project. Saturday morning we met at the top of Hays Woods, just off Agnew Road. (Google Map Parking at Top of Hays Woods.) Sarah was using the MTB Project app to check our route. We figured we could easily get in 5 miles doing an out and back on the Hays Woods trail or figure out a loop along the way. The first mile of the trail was fairly straightforward and pretty but a bit hilly. At nearly a mile in we had great views of the Monongahela River and Oakland and I was thinking this is so awesome! What a great place to run. From that point on, it started to get a bit sketchy. At first the trail became heavily eroded. It was like running along a miniature series of ridges and valleys, and you had to watch every step closely to avoid rolling an ankle. Then the trail became significantly steep with loose scree, making it difficult to maintain any running pace without the threat of wiping out. The trail traversed open areas along a power line and then cut back into the woods. When the it came to a T, we had to decide, left or right? We checked the map, and somehow we had gotten off the marked trail on the app. We were clearly standing on a trail, but they weren't marked or visible on the map. It was obvious now we should have gone left around a power line tower at the very top of the hill. We thought for a moment about going back, but figured surely one of these trails would connect back up to a mapped trail sooner or later. We went left first and got about a half-mile before the trail just disappeared completely under overgrown weeds and downed trees. We turned around and decided to go for the right trail back at the T intersection. That cut down to a stream with a clear path across and then just disappeared into an open forest. We decided to keep going. The path, while not obviously a trail, was an open forest floor with a road off to our left. From the map we determined that if we cut straight across, keeping the road on our left, we would pick up the marked Hays Woods trail ahead and have direct line back to the car. The clear forest floor didn't last long. It became cluttered with downed trees, overgrown brush and knotweed. The terrain became steep and we scrambled up and over hills and around what was clearly poison ivy. Wearing running shorts and tank tops I was convinced we would end up covered in poison ivy. Needless to say we hadn't been running for the last 20 minutes. We were just scrambling, sometimes on hands and feet. We finally reached the Hays Woods trail and it was clear we were on the right path, both on the map and underfoot as it was a wide concrete path. We headed back in the direction of the car at the top of the hill. After about a quarter of a mile, we reached a point where we just couldn't move forward with out a machete. The trail was completely overgrown with knotweed 6-7ft high. The thought of trudging 2.5 miles up hill through it was daunting, and we both had places to be by 10 a.m. We had started the run at 7:30 a.m. and by then it was nearly 9 a.m. We had maybe gone 2 miles. We decided to turn back and take the trail back to Glass Run Road, which appeared to be a half-mile back. From there we would follow it to our cars. It was a half-mile of more of the same overgrown knotweed, but we finally got out of the jungle. While I was looking at the map on how to run the road back to the car, Sarah had pulled up the Uber app and discovered a ride was a minute away. I stared up and down Glass Run Road and saw a winding road with no shoulder and lots of traffic. While I hated to take a ride back to the car, running on that road was not a wise decision. The poor Uber driver who picked us up must have thought we were nuts. We told him the story and he laughed with us, but also gave us an odd look. Once we got back to our cars, we searched for the nearest pharmacy to find some poison-ivy disinfectant. After a shower at home it was less of a disaster and more of a comedy. A little dose of Type II fun usually makes for a some great stories and some good laughs. I won't soon forget this little trip and I'm looking forwarding to going back to Hays Woods this winter, when the Pittsburgh jungle disappears. 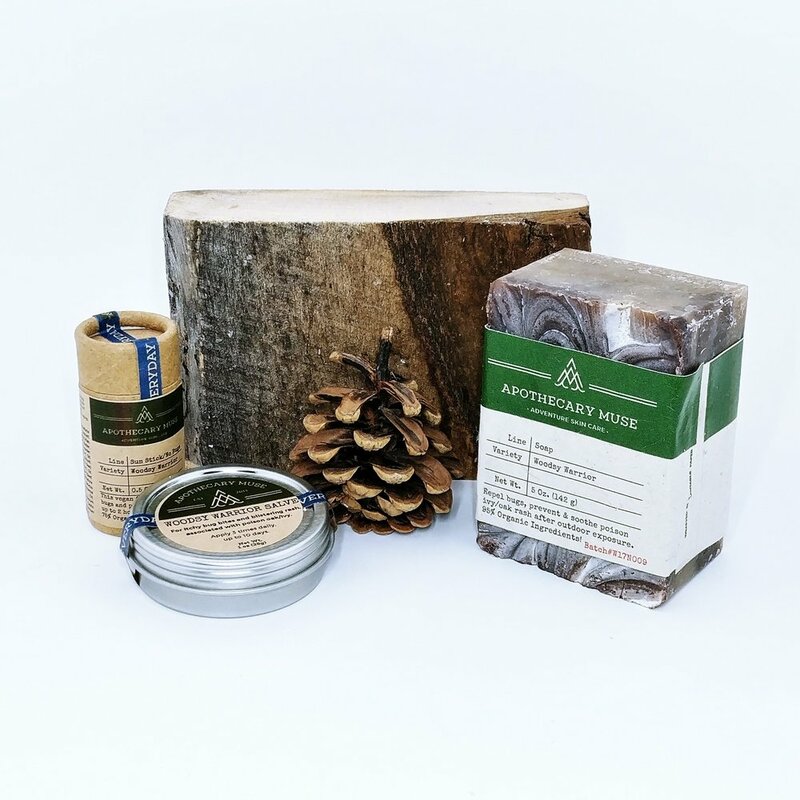 Whether you're interested in exploring Hays Woods or any other outdoor adventure, we recommend trying some of Apothecary Muse's Woodsy Warrior poison ivy/oak treatments and bug repellent products made locally from natural ingredients. It comes in a soap, salve, or sunstick form. We are proud to carry this and other products by Eryn of Apothecary Muse, locally made here in Pittsburgh and delivered to us direct by bike. Note: Hays Woods is heavily used by hunters so be sure to wear orange or avoid it all together during hunting season. For more info on Hays Woods be sure to check out the webpage Friends of Hays Woods. We'd love to hear about your adventures and/or misadventures. If you have a great story to tell about some local excursions you'd like to share send us a message at info@3riversoutdoor.com we'd love to write about it in our blog or have you come share about it in the store.